Aún no. Sobre la reinvención del documental y la crítica de la modernidad. Ensayos y documentos [1972-1991] [exh. cat.]. Madrid: Museo Nacional Centro de Arte Reina Sofía, 2015, 352 pages; pp. 181-195, 200-201, 222-228, 260-262, 267-274, 293-308 (translated by Marta Pino Moreno). ISBN: 978-84-8026-507-2. 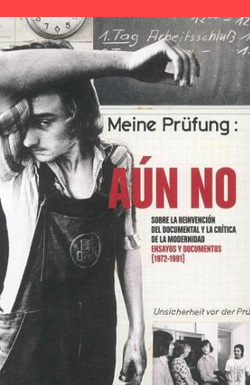 Spanish translation of essays written by Paul Carter, Bob Long, Jörg Boström, Terry Dennet, David Evans, Silvia Gohl, Jo Spence, Don Slater, Paul Trevor, Chris Steele-Perkins [Exit Photography Group], Su Braden, Terry Morden, etc. for an exhibition catalogue published by the Spanish museum of modern art Museo Nacional Centro de Arte Reina Sofía (MNCARS) on the reinvention of documentary and the critique of modernism. Exhibition title: Not yet. On the Reinvention of Documentary and the Critique of Modernism. MNCARS, 11 February13 July 2015.